Forum Index > Historical Arms Talk > Real, Fake. The final Test! Posted: Fri 13 Jul, 2018 10:24 pm Post subject: Real, Fake. The final Test! It's your final test. Here are 18 white weapons. Some will be familiar to you! But the test does not stop there! do you see similarities between all these ads? If yes, specify which ones? Be careful today, you are not only a collector of blades, an antiquarian, an counterfaiter of weapons, an expert or a fan of Holly Peter Johnsson. You are Sherlock Holmes too! The answer is facilitated by the fact that the majority of these swords come from two sellers with a great probability that is a single seller with two different nickname. The only thing I can say is that this person manufactures to sell and that his business is fine. I can only have compassion for the buyers who are the victims of his business. I would like to have in hand the sword with the broken blade the photos do not allow me a verdict on this last and ditto for two of the daggers being part of the group of three. Fake. I haven't even looked at all of them. Even without knowing how to discern between genuine antiques and fakes, the estimates give it away. Genuine swords in this condition should probably be listed with estimates and starting bids between $ 20,000 to $100,000 USD. Thus, the lot estimates are absurdly low, betraying their true nature. Also, it's exceedingly odd that the bidding started at €1. I am unaware of any legitimate auction houses offering swords with that low of a starting bid- regardless of whether or not there was a reserve price. These details alone are enough to make the evaluation. PS: The pommel on the "Épée de chevalier médiéval Oakeshott à deux mains" is about as authentic as a $3 bank note. By the way, Xavier, you keep referring to Peter as "Holly". Holly is a type of bush, with prickly leaves and typically red berries. Do you mean "Holy"? Wasn't holly holy for Druids? As a collector, I appreciate your objective. However, I find the message blunt, yet cryptic. I understand that It is your belief that all of these weapons are not what the sellers claim them to be, yet you are not explaining how you know this to be true. Maybe you can reveal the backstory to allow for some clarity? After all, I’m not really sure how Peter Johnsson fits into this. Was he the original creator of these weapons? I agree. I also don't find this particularly useful. It's more game playing than anything informational. Games aren't really fun if there isn't a payoff at the end. Holly, holy; it's the same finally, no? Peter Johnsson was the original creator of these weapons? Absolutely not! how does it start? By the sword No. 7 (the Castillon style XV) sold on Catawiki by the seller "Vikeragnar"
What is surprising is this weapon was seen and taken in hand by "experts" who can't say if it was true or false. Others had doubts; and one expert even declared it absolutely authentic. every member's doubt opinion is right! Holly Holy Peter was kind enough (as well as others of his friends) to take an interest in this weapon. His conclusion is categorical : 98% fake. "It appears to (...) be a recently made sword that is distressed and patinated to look like a genuine antique sword. There are a few aspects that stand out that is very similar to other swords (...) seen that were without doubt not genuine. One thing to take note of is that the black patina is very shallow and that white metal shines through in the high spots. This alone should raise some concerns. The nicks in the edges have burrs (small raised edges). This is what a freshly damaged edge looks like. [...] The pommel has a shape that is shared with many contemporary swords. There are some details that are shared among antique originals that are lacking[....] This pommel was most probably turned on a lathe and then brought to white or yellow heat and kicked around on the floor or thrown into a bucket of iron scrap and stones to give the surface some unevenness [...]. The tang has a shape that suggests forging to shape in a modern power hammer. Most of its form is very straight and even. It is quickly shaped by a rather skilled blacksmith. (...) The form speaks of efficient forging with modern tools. Most original tangs have a slightly uneven form that bears trace of many individual blows of a hammer. The blade is irregular in a way that suggests that it was forged quite closely to shape and then given a long soak in acid but without being grund to a fine finish first [...] the edge was never truly sharp and will probably undulate from side to side (as a result of hammer blows) if you sight down the blade looking along the edge." "... these swords are made in the same workshop. The same "hand writing" in their shape. The same anomalies on pitting and superficial/thin corrosion. (...) the fullers have been forged but never ground [...]. The same goes with the overall surface of the blades [...]"
The weapons 1 to 18 are sold on Catawiki by sellers : vikeragnar, balkanCelts, Thomasfj64, Keltenfreak & keltenfreakchen, chlodwig13. 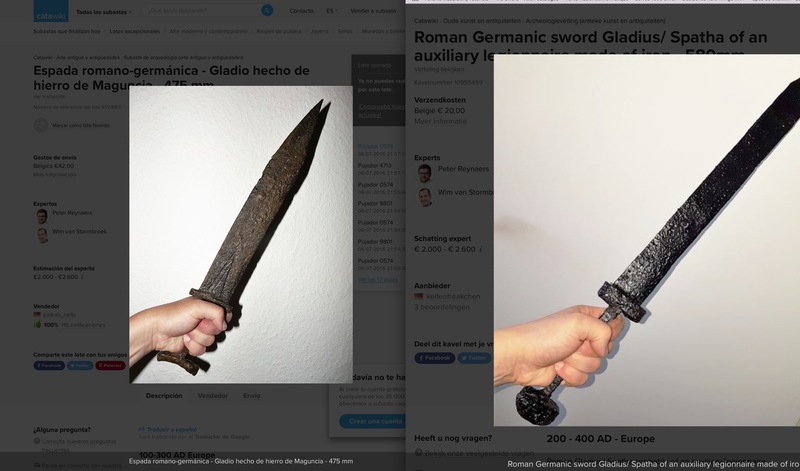 - The two sellers "KELTENFREAKCHEN" and "BALKAN CELTS" make the same type of photo.They both hold the sword in the left hand and have the same hand creases. - The gold door handle is exactly the same !!! if there is a dispute of the sale by the buyer, Catawiki asks to return the weapon to the seller, and after refund the money to the buyer. There is just a big problem, they push to put into the sale circuit a fake. The buyer wants to get his money, and the seller will sell the false sword to the next victim. proverb of the day : delinquents are like slugs; they always leave a trace behind them. Thanks for posting this additional information! I was getting frustrated by this "game." Still, myArmoury members provided some good observations that were ultimately confirmed by the comments from Peter Johnsson. I think you've done some valuable detective work and I am fascinated to learn how this story develops and (hopefully) resolves. One bit of feedback I would offer is this: your mocking tone and Holly/Holy (?) nicknames in earlier messages implied that Mr. Johnsson was in some way a target of your investigation, which was worrying and dismaying since he is such an admired figure in the world of historical arms. With your last update we can now see he has provided you with detailed expert analysis and is "on the side of the angels," so to speak, but I'm sure I was not the only reader who was misunderstanding your tone in that way. Next time please just skip the game and unmask the fakers! There is no doubt about Holy PJ! I hope that Peter is okay with you quoting his emails and posting screenshots. This is actually against our rules here and is generally thought of as being poor behavior on the Internet since emails are private communications. All those items would be collector items were they real. It seems odd, however, that someone would collect such disparate originals, yet have them all in more or less the same condition. balkan_celts / keltenfreakchen both have a mix of Roman antiquity and high middle ages, yet all of the swords show very much the same patination and overall condition (no remains of the grips, apparently solid mountings, very similar corrosion on the swords). As if someone had made a piece's condition the focus of their collection rather than a time period or region. VikeRagnar boasts one handed swords and a few daggers spanning almost 400 years and different regions, yet all look to be in the same condition aside from the one that was broken. I wouldn't mind looking at a finished sword by that blacksmith. They seemed to be quite good as replicas go, at least visually and in terms of raw stats. Pardon my being blunt here. All this "game" does is highlight the failings for the maker of these fakes to rectify next time he/she is making stuff. It is utterly naive to think that they are not reading the exact same forums as you and I.
James: that's why I only responded to a single thread a single time. Realized the same, just a bit late. I don't agree. Yes, that CAN happen, but my experience in the antique firearms community is that it won't. I've avoided wasting money on forged muskets based on information I learned in threads like this and the forger is STILL making the same fakes years later.... and still selling them to gullible buyers. Just not the buyers from the forum where an expert offered his opinions on why the pieces offered were, in fact, forgeries. His prices have dropped though. This site is about education, right? Doesn't it make sense to educate our members on recognizing forgeries, if only so we do not take such pieces as historical examples? Such knowledge should not be retained just by those in a small, exclusive circle, IMO. I agree with Mr. Smith. This thread has been useful to me, and I have to keep an eye out for fakes all the time. An interesting thing about the forgers and their quarry is that neither pays much attention to forums like this, strangely. They don't seem to know about them. It doesn't matter how much good information is out there. MOST folks simply won't take the trouble to do any research. The old adage "A fool and his money are soon parted" is as true today as when it was first written That's the whole reason fakers of antiques still thrive. They don't care if 99% of potential customers know what they're peddling is fake..they only need ONE buyer to succeed. Yes 11 days and 3 discussions to finally know that it's scam. yes the subject is sensible and I accept the reproaches or the fears that I'm a forger or that I help them. Only the judgment of Peter Johnsson counts because he knows everything. It was necessary to manifest these false because it is important for amateurs who begin and also for the victims who could recognize their weapons. some are not happy because I gave indications of Fake making. I accept that. but what I have written is generalities that you yourself have noticed. may I also say that the first discussion concerned a weapon for which you had the most information (close up photos, microscope photos, measurements, ...) and yet some thought it could be true. So the general consensus is pretty much all of these are fakes? Is that a sure thing? 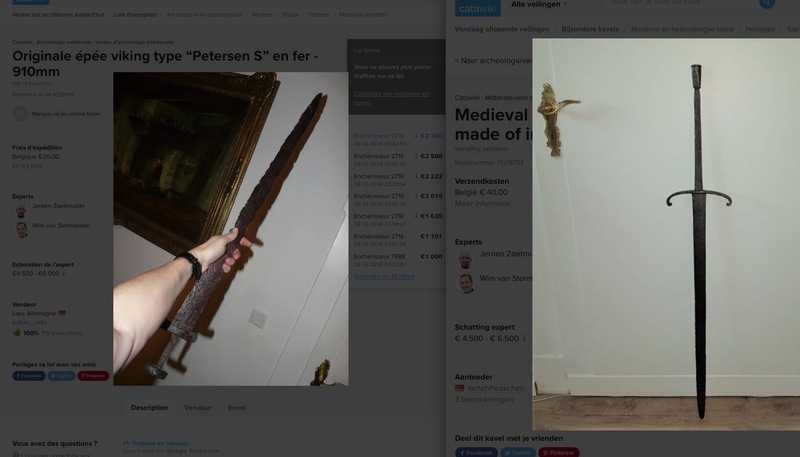 I'm just curious as I have bought Viking Age / Medieval swords in the past (one I'm 99% sure is legitimate, and the other one after reading these posts has me down to 50% when I was 90% as it looks very similar in form and condition as some of these). I have purchased through an antique arms dealer here in the U.S. and look to him as well as myself to get some confidence in the authenticity of an object. I would love to know what to look for. They look legitimate to me, however I am no expert. I do bladesmithing as a hobby and it seems like it would be tough to reproduce the surface pitting corrosion visible on the surface. Is there some sort of chemical method this fakers use to reproduce that old look? It seems like it is impossible to buy a real sword from antiquity in today's world if this is indeed the case. Have any of the people that make these fakes been exposed? I'd love to see some swords that were actually taken from someone faking it to see what a 100% positive fake looks like. I've seen some on ebay that are clearing just cut from bar stock and then sprayed with acid to get some rust - so those are easy to spot. But the surface pitting on these swords make me think there's a good chance they are the real thing. Also, these were definitely forged and not cut from a bar, so a lot of work would have gone into these fakes if that is the case. Sorry for the long message. I just want to understand what's going on. You will find on the forum some general explanations on the points that make doubt about the authenticity. But you will not find anyone who will explain to you the methods to make fakes. The best thing is to always doubt what is sold and to assume that they are fake unless you have a traceability from A to Z. This is very difficult except to pay expensive expertise in a laboratory to verify the authenticity. It is much better to buy a new sword from a good blacksmith, than to search after an authentic old, rusty and spoiled piece of metal, whose place is ultimately better to be in a museum.